Several Viking fortresses have been excavated in Denmark. Trelleborg was excavated between 1934 and 1942 on the Danish island of Sjælland. It was built in the 980s a.d. during the reign of king Harold Blåtand (Bluetooth). Within a circular earthwork are 16 large longhouses set in groups of four in which the people lived and worked. The longhouses are somewhat in the shape of a dragon ship. It is estimated that approximately 300 people lived at Trelleborg. The stamp shows a modern plan of the fortress with longhouses, both inside and outside the earthwork circle. 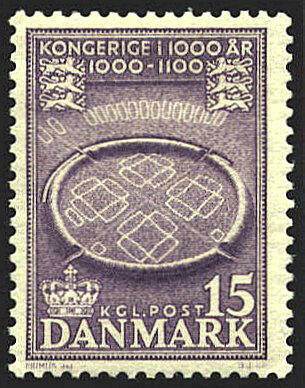 The stamp is one of an issue of 10 stamps to mark the 1000th anniversary of the Danish kingdom. This stamp was intended to mark the period from 1000-1100. 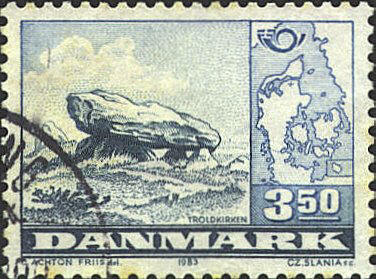 In 1983 Denmark issued a stamp which showed a picture of Troldkirken, a pre-Christian shrine near Limford. The location of Troldkirken is indicted on the map by a "+" at the upper end of the Denmark peninsula. Egeskov Castle was built by the Lord High Constable Frands Brockenhuus in the middle of a lake in Denmark. Several thousand oak pilings were driven into the lake bed to support the castle, and its name Egeskov, literally “oak forest,” reflects that the large quantity of trees that were used. The castle has a double wall so thick that it holds staircases and a well to provide a water supply during a siege. The outer walls have machiculations, holes in the parapets through which stones, weapons or scalding water or oil could be thrown, and embrasures from which to attack the enemy’s flanks. Though the castle was built for defensive purposes there is no information that suggests that it was ever under siege. The location of the castle is marked with an X on the island of Fyn, in the middle of the map on the stamp.